Battle of Coronel: 1st November 1914. 91 Irish Sailors lost. The destruction of Admiral Sir Christopher Cradock’s squadron by German Admiral von Spee at The Battle of Coronel occurred on 1st November 1914 resulting in the loss of 1,654 souls, 91 known to be Irishmen, 26 of them Ulstermen. -15 year old Midshipman Gervase Ronald Bruce from Downhill, Derry, one of ten cadets lost on MONMOUTH. -Armagh man Gunner James McVey who was underage on enlistment and was likely the first Ulsterman from the Royal Marine Artillery to die in the Great War. -Antrim man Private Adam Morrow who was likely the first Ulsterman from the Royal Marine Light Infantry to die in the Great War. -Five more Ulster teenagers were lost; Belfast boys Stoker (2nd) John McAteer, Boy (1st) William Connell, Able Seaman William A. J. Wilson and Ordinary Seaman Herbert Kelly as well as Ordinary Seaman Henry McNally who was from Draperstown. The Royal Navy, had spent months looking for the German East Asiatic commerce-raiding squadron known to be operating under Admiral von Spee in the Pacific without success. An intercepted radio communication, in early October revealed details of a plan devised by von Spee to prey upon shipping in the crucial trading routes along the west coast of South America. 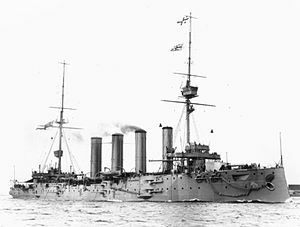 Patrolling South America at that time was Admiral Cradock’s West Indies Squadron, which consisted of two armoured cruisers, HMS GOOD HOPE and HMS MONMOUTH, the light cruiser GLASGOW, and a converted ex-liner, OTRANTO. Cradock was ordered to deal with von Spee even though his fleet was ill-matched when set against von Spee’s formidable force of five vessels, led by the armoured cruisers SCHARNHORST and GNEISENAU plus three modern light cruisers. On 18 October von Spee, having heard of the solo existence of the GLASGOW, set off with his squadron from Valparaiso with the intention of destroying it. Cradock, who was aware that he was outgunned had been waiting in the hope of naval reinforcements. 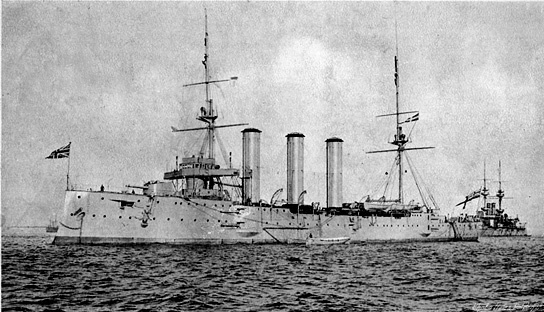 The Admiralty dispatched an armoured cruiser DEFENCE and an elderly battleship CANOPUS but neither reached Cradock before battle unexpectedly commenced on 1 November 1914. Deciding that he could wait no longer for reinforcements, Cradock determined to sail from the Falkland Islands to rendezvous with GLASGOW at Coronel, where she was gathering intelligence. The First Lord of the Admiralty, Winston Churchill, issued orders to Cradock on 28 October instructing him to halt, pending possible reinforcement from the Japanese Navy. However Cradock had intercepted a radio signal on 31 October that LEIPZIG, the slowest of von Spee’s light cruisers, was in the area. He promptly ordered his squadron north to cut it off and found himself confronting von Spee’s entire force the following day at around 4.30pm. At this stage it is probable that Cradock’s force could have escaped by sailing towards CANOPUS as with the failing light, von Spee would most likely have lost contact with the British squadron. Instead Cradock chose to stay and fight; however he ordered OTRANTO to break formation and flee. In difficult seas, von Spee moved his faster vessels out of Cradock’s firing range; at sunset with the moon clearly silhouetting Cradock’s fleet, he began to shell the British force, with SCHARNHORST’s third salvo crippling the flagship GOOD HOPE and both GOOD HOPE and MONMOUTH were destroyed shortly afterwards, MONMOUTH under repeated battering. Newspaper reports about Coronel at the time were confused and it was not confirmed until many days later what had actually happened to Cradock and his fleet. In fact on 4th November it was reported that HMS GOOD HOPE had not been damaged at all and on the 7th November it was reported that ‘The Admiralty have now received trustworthy information’ and that HMS MONMOUTH was ashore in Chile. Although GLASGOW and OTRANTO both escaped, 1,654 men were drowned on GOOD HOPE and MONMOUTH. No survivors were found and Cradock himself was lost with his ship. Von Spee’s own fleet had suffered little damage, and sailed thereafter to Valparaiso to a rapturous welcome from the local German population. Once news of the scale of the British defeat, and its consequent humiliation, reached the British Admiralty in London a decision was quickly taken to assemble a huge naval force under Admiral Sir Frederick Sturdee. This was promptly dispatched to destroy von Spee’s force, which it subsequently did, at the Battle of the Falkland Islands. The loss of these men will be marked within the introduction to QFT’s screening of ‘The Battles of Coronel and Falkland Islands’. This new restoration from the British Film Institute National Archive is one of the finest films of the British silent era – a thrilling reconstruction of two decisive naval battles of 1914, recreated and filmed 13 years later, in peacetime. With a new score performed by the Band of Her Majesty’s Royal Marines.